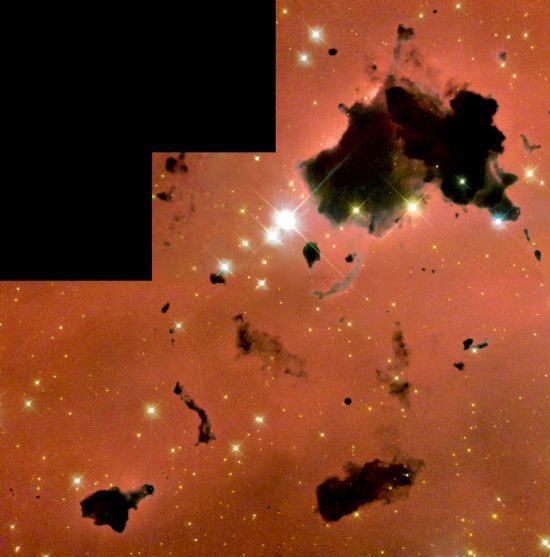 Dust clouds, known as ”Thackeray’s globules”, in IC 2944. Credit: NASA/ESA and The Hubble Heritage Team (STScI/AURA). Dark, opaque structures are common in the Universe. The Interstellar Medium (ISM), through which the Solar System and all other star systems are moving, is mostly hydrogen and helium. Dust particles, a combination of carbon and silicates, account for about 1% of the ISM. Those particles are, typically, less than one-tenth of a micron in size. One micron is equal to one-millionth of a meter, so the dust is smaller than the frequency of blue light (.45 microns). That cloud of gas and dust encompasses the Solar System. Comparing density in various locales, the ISM is found to be extremely diffuse. Atmospheric density on Earth is about 1.2 x 10^-3 grams/cubic centimeter, with a distance between particles of 10^-7 centimeters. The best laboratory vacuums draw 10^-12 grams/cubic centimeter, with a particle gap of 10^-4 centimeters. Nebulae, like IC 2944, are estimated to be 10^-21 grams/cubic centimeter, and a particle distance of one-tenth of a micron, while density in the ISM is 10^-24 and 1 centimeter apart, respectively. Prior to the ISM’s discovery, consensus astrophysicists did not predict that it would be there, because supernovae shockwaves should have blown it away. After its discovery, a common belief among astronomers is that the Solar System “plows through” the ISM. One important characteristic of the ISM is that it contains ionized particles. It is those electrons and positive ions that are critical to understanding the behavior of the ISM and how the Solar System interacts with it. Although the ISM is extremely diffuse, if charge separation takes place in different regions, a weak electric field will develop. An electric field, no matter how weak, initiates an electric current. When Voyager 1 experienced “unusual events” as it approached the boundary between the Sun and interstellar space, otherwise known as the heliosphere, Electric Universe advocate Wal Thornhill explained that the spacecraft was entering a “double layer”, or Langmuir plasma sheath, between the solar plasma and the plasmas of the ISM. Since electromagnetic fields strong enough to hold clouds of gas and dust together surround the Solar System, then electric charge must be flowing through the ISM in order to create those fields. As mentioned, because of those influences, rather than a comet-like tail, a “rough bubble-shape” best describes the Sun’s heliosphere. Electric Sun theory presupposes that the Sun is a positive terminal, or anode, in a complex interstellar circuit. The Sun’s negative pole, or cathode, is a field of charged particles surrounding the Sun’s electric discharge billions of kilometers away. As Thornhill predicted, double layers at the heliosphere’s edge isolate the Sun’s plasma from the ISM. A dark mode electric discharge radiates from the Sun in all directions. That “solar wind” travels outward to the edge of the Solar System at 700 kilometers per second, where it encounters the heliopause. Heat and pressure cannot explain how charged particles are accelerated as they pass by the planets on their way to the heliospheric cathode.